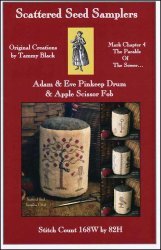 Adam & Eve Pinkeep Drum [W5436] - $12.00 : Yarn Tree, Your wholesale source for cross stitch supplies. Cross stitch pattern by Scattered Seed Samplers. This pinkeep drum features Adam & Eve standing by a tree, taking off apples. The back of the drum features a key with the letters A & E stitched beside it. A bird with an apple is also stitched on the back. Stitch count 168w x 82h.